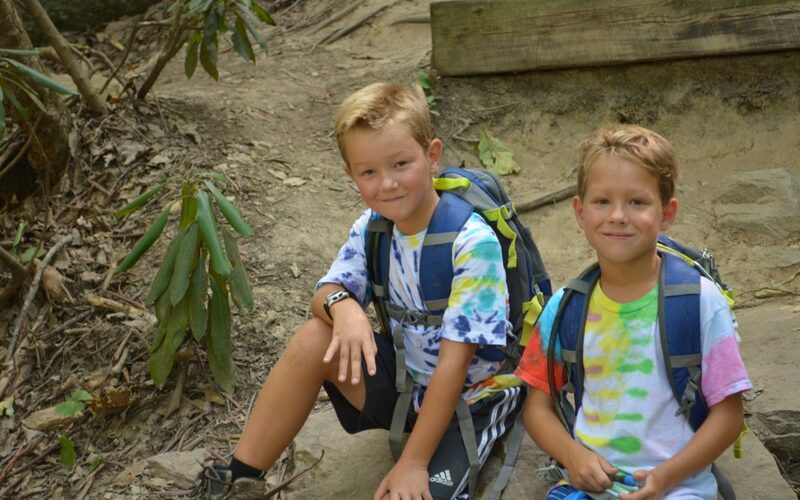 Perhaps you’ve noticed our new Hike NC statewide hiking program, seen that it’s geared toward new hikers, noticed that most of the more than 60 hikes scheduled over the next couple of months aren’t crazy long (between 2 and 4 miles), and, most significantly, taken note of the fact that the hikes are geared toward people with little or no hiking experience. Maybe you’re skeptical. Maybe you signed up for a group hike once and, not long into the hike, discovered you were the only one in your group. Maybe you’ve thumbed through an outdoors magazine and noticed the ads for — yikes! — $230 boots! Maybe you worry about bears. If any of this sounds familiar, then you are a prime candidate for Hike NC. I’ll get left behind — and maybe lost. First, our hikes are on beginner-friendly trails. They are blazed (uniform symbols periodically placed to help guide you down the trail), they are well maintained, they are easy to follow. And they are even easier to follow in the company of a trained guide (yes, we have a hike leader training program). Every hike has at least one hike leader, who leads from the back of the pack. We’ll go over the hike’s route at the trailhead; faster hikers are welcome to go on ahead. No matter how slow you are, there will always be the hike leader behind you. You need pricey equipment. Want, maybe. But need? Starting out, for short hikes all you “need” are comfy, supportive shoes: running shoes should suffice for your first few 2- or 3-mile hikes. You also need water, which you can get for free. You can even get a bottle to hold it in for free: on each hike, we offer incentives, including a nifty collapsible water bottle. 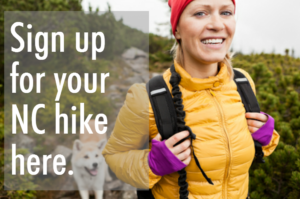 Even if it’s cool out, even if you’re only hiking a mile or two, get used to taking water on the trail. Staying hydrated keeps your body happy, and a happy body is key to your happiness on the trail. Clothes-wise, comfort and warmth are key. You shouldn’t need high-tech performance gear on hikes in friendly fall weather; what you’ve got in your closet should work. There are bears. There are bears, but — and don’t take this personally — they want nothing to do with you. They aren’t sure what to make of us, but one thing that is for sure: you’re too big and too much trouble to eat. (They’re more into berries and bees.) One caveat: mama bears are protective. Don’t get between a mama and her cubs and you should be fine. And not to heighten your concerns, but there are also snakes, poison ivy, annoying flying things and more elements of nature that get a bum rap. Part of the reason you’re on the trail is to make you aware of the natural world you live in. I can’t walk that far. A funny thing happens on group hikes: you get to chatting and before you know it — the hike’s over!? That couldn’t have been 3 miles! On our hikes, you hike at your own pace, and even if you are your own worst enemy in that regard (meaning you tend to walk to go out too fast, then peter out), the trail often dictates your pace. Climbs, twists, turns, rocks and roots all have a way of slowing us down. What if I can’t keep up? Again Hike NC is all about the beginning hiker. You will not be left behind: the hike leader will always be at the end of the group. Our main goal is to provide a supportive environment for new hikers, folks who’ve been intrigued but not sure how to get started. Sound good? Then join us. Check out the rundown of hikes we’re offering at GoHikeNC.com, register (it’s free), then join us on the trail.